A new study by researchers at the UCLA School of Nursing shows that using eye-tracking technology could improve nursing education by reducing the role of subjective assessments and by providing more consistent evaluations. With more than 400,000 deaths each year in hospitals from preventable causes, ensuring patient safety relies on health care educators to train and certify safe, competent practitioners. Until now, educators have been using assessments that are primarily subjective and provided inconsistent results to determine competency. Eye-tracking technology has been used to test and train airline pilots. UCLA School of Nursing researchers decided to test whether it could be used to determine differences in task completion between novice and expert nurses during simulation training. Expert nurses are intensive care or emergency department nurses with five or more years of experience and novice nurses are senior undergraduate nursing students. Results demonstrate that using this technology just might be the answer in the assessment of nursing clinical performance. The study is published online ahead of print in the journal Clinical Simulation in Nursing. 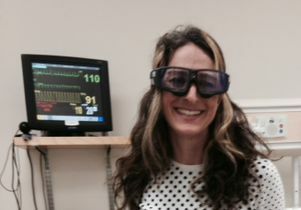 Lecturer Barbara Demman wearing eye-tracking glasses. Eye-tracking glasses use sensor technology and an embedded, unobtrusive video camera and technology to track the movements of a person’s pupil, such that it knows exactly where a person’s eyes are focused. It observes and records eye behavior such as pupil dilation and also records where the wearer is focusing her or his attention. 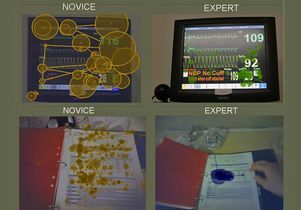 In this study, eye-tracking technology was used to compare the performance responses in seven basic nursing tasks — such as placing a pulse oximeter on a finger, listening to lung sounds, applying an oxygen delivery device — between expert nurses from two hospitals and 35 nursing students in a simulation of a heart failure patient who was short of breath. A written test was administered to all participants to ensure that both groups had equivalent knowledge and understanding of heart failure and how to care for this type of patient. The eye-tracking data showed a marked difference between how the novice and the more experienced nurses processed information in a busy environment. While the students spent a significant amount of time looking at data that was not relevant to the patient’s immediate problem, the experts seemed to know what was important and in turn, were able acquire the pertinent information much faster. Of the seven tasks, all the students were able to complete only one, while those in the expert group completed four of the seven. The “time to task” completion was also significantly different between the groups in 5 of 7 tasks. The study yielded an unexpected but valuable finding as well: an unprecedented bird’s-eye view of the events during the simulation. For instance, the participants were required to administer a medication into the patient’s intravenous line. In video shot from the standard overhead perspective, the participant’s performance in using a sterile technique is commonly obstructed as they bend over the patient blocking the ceiling-mounted cameras. With the eye tracker, there is a full view of the participant’s performance, making it an ideal tool to assess competency. Research is ongoing to further test the utility of eye-tracking glasses as an assessment tool in simulation and in clinical settings. This is being done with video review and competency scoring by both experienced nursing faculty and clinical experts who routinely perform assessments of nurses to ensure the reliability and objectivity of eye-tracking glasses as an assessment method in simulation.